About a year ago, my sister signed me up for Martha Stewart Living. I love reading the magazine, I really do. Although, I’ve never actually made anything from it. When I hang a holiday wreath, I don’t cut stenciled leaves from gold foil and staple gun them to a wooden frame. I buy one – and that’s okay. I didn’t handpick fabric then sew our bedroom curtains (though a few years ago, I did buy Ikea curtains which had to be hemmed to size with iron-on patches). I bought them from Bed, Bath & Beyond – and that’s okay. For my sister-in-law’s baby shower, I didn’t hand squeeze lemons and boil sugar water for the lemonade. And that’s okay too – because sometimes, who am I kidding – often times, there’s a certain virtue to making great things happen within the time you have available, to ready-made goodness and to shameless shortcuts. Four ready made, good ole, store bought items that I keep handy in our freezer and pantry are: (1) a variety of frozen Deep brand onion kulchas, garlic and plain naans and tandoori roti (Trader Joe’s brand Indian breads are really good too), (2) Trader Joe’s Vegetable Masala Burgers, (3) Deep or Laxmi brand coriander chutney and (4) cheddar cheese of some variety, either shredded or in a block. Perhaps an unlikely combination but in a desparate search for savory, spicy, filling and above all fast, I made these four ready made items fast friends in hot skillet and discovered ready-made goodness…a ten minute desi masala burger slathered in coriander chutney and mild, cheddar cheese. First: Pan fry the Trader Joe’s masala burger patty in a hot skillet with no oil until golden on both side. You don’t need any oil because the water/ice on the patty from the freezer is sufficient for cooking. Remove from the pan when golden. 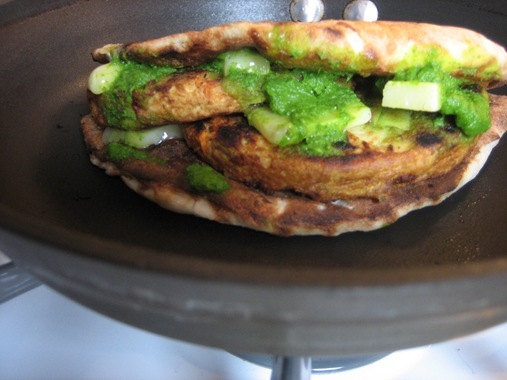 Second: Heat the onion kulcha in the pan evenly on both sides until golden. Remove from the pan. Third: Using a paring knife, gently cut the onion kulcha down the center without cutting all the way through the bed. Fourth: Arrange half of the cheese slices on one side of the kulcha. Cut the patty in half and arrange in the kulcha. The halves may overlap. Arrange the other half of the cheese on the top of the patty. Fifth: Drizzle coriander chutney over the top of the patty. Fold the other half of the kulcha over the sandwich. Place the sandwich back into the pan on medium heat and cook until the cheese melts. Carefully flip if it starts to brown too much on one side. I have to imagine that if Martha wrote the above recipe it would involve cutting then boiling fresh veggies, hand packing patties, mixing flour and water and kneading dough and grinding fresh coriander…maybe even milking a cow and churning your own cheese. Thanks, but I’m opting for ready made goodness on this one. What are your favorite tricks for ready made goodness – the ready made items that have permanent homes in your pantry and freezer? I’m keeping an eye on One Food Guy’s Tuesday’s Tastings where he features store bought foods and critiques to help brainstorm more ready made goodness essentials…which I discovered thanks to Jenn, The Leftover Queen – two foods blogs with themes in line with my own busy, food loving heart. This is so funny…I made the same exact meal (minus the bread) last week. Love those TJ masala burgers! By the way, you are now out of the Kohinoor vegetable cutlets and seekh kababs. Thanks for having these in your freezer. For frozen food, they were very tasty. Hmmm I’m surprised you liked the kebabs. I thought they were awful but the cutlets were pretty good. I am such a big fan of Trader Joe’s!! These burgers are one of my fav items to get at TJ…never tried them with kulcha though!! Chandani, so much better than with a bun on a kulcha. Btw great blog that you have! I love TJ’s too – they have some of the best ready made items ever…and not too unhealthy either. I too have Deep brand’s naan and garlic naan in my freezer. I’ve not tried the kulchas. I once tried making naan and it was a disaster. It came out well, but I didn’t like the taste. @Madhuram, thanks for stopping by! Naan from scratch is very brave…I’ve heard it takes even just a lot of muscle power to roll out the dough. I remember seeing a relatively easy looking recipe for it somewhere. If I find it, I’ll pass it along to you.